Kari: I drew this before I learned that Ghibli was shutting down; you can imagine what my subject would have been if I had waited just one day. 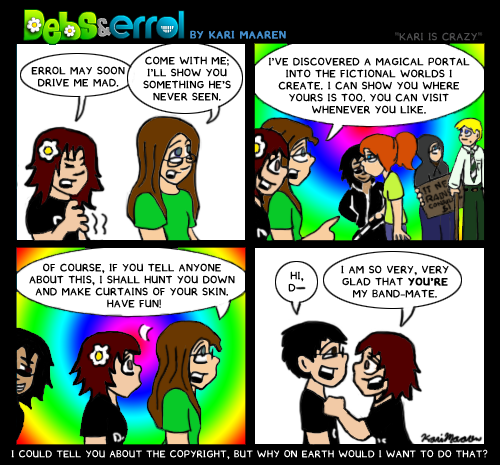 Otherwise, it’s worth noting that: 1) yes, those are some of my characters from West of Bathurst and It Never Rains in the second panel; 2) I drew this comic entirely digitally, using D&E’s template, and got quite frustrated because of how teeny weeny that template was; 3) I have never made curtains of anyone’s skin. Yet. Debs: Hooray for Kari! Check out It Never Rains! Personally, I don’t think Kari has actually thought through the practicalities of making curtains from peoples’ skin… I had to stop myself from refuting it point for point because it got very morbid very quickly. Making dice from peoples knuckles is a more believable threat if needed. Oh, it’s terribly impractical. That’s what makes it FUN. Casey and future Rose seem to know each other. Somehow that doesn’t surprise me. Also, I think Evil Marie may have escaped the portal there. Someone should speak to Errol about her cropping up during comics now and then. I’ve been looking forward to this ever since it was said that Kari would be doing a guest comic, and it did not disappoint. Evil Marie will ALWAYS escape any portals. It is her way. Hurrah for lack of disappointment.